Chrysanthemums are a flower breed that is centuries old. They are bred around the world in a vast array of different colours and shapes. Chrysanthemums are generally in the top 2-3 most produced flowers in the world. The vase life of the chrysanthemum flower is very long, providing the flower is fresh and well kept. There is a great deal of difference between locally grown fresh Chrysanthemums and import stock. 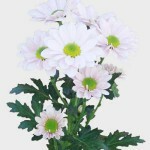 Floraco Spray Chrysanthemum are available in more than 20 different colours. These have many smaller flowers in a cluster together, making them very useful in many different applications. The other form Floraco stock is Disbud Chrysanthemum. These have one large flower, and are available in a few select colours. The disbud chrysanthemum is a very striking bold flower. Contact Floraco for wholesale chrysanthemum. Floraco Chrysanthemums are produced every week of the year, ensuring supply and maintaining top quality and vase life, if you’re looking for chrysanthemums that last ask for Floraco’s wholesale chrysanthemums.